In fiscal year 2009, OSHA investigated 1,947 claims but found merit in only 3 percent of complaints. The Department of Labor Office of Inspector General estimated 80 percent of OSHA investigations under section 11(c) of the Occupational Safety and health Act, the Sarbanes-Oxley Act and the Surface Transportation Assistance Act in 2009 did not meet one or more investigative criteria. Whistleblower advocates say OSHA has failed to make the whistleblower program a priority and lacks the power to ensure consistent policies across regions. 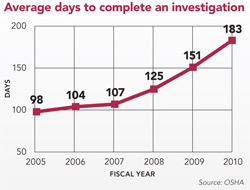 OSHA's Whistleblower Protection Program faced a tough year in 2010. Two federal reports identified serious flaws in the agency's effort to protect employees who face retaliation for reporting unsafe or illegal conduct. One advocacy group suggested OSHA "get out of the whistleblowing business." Even OSHA administrator David Michaels expressed dissatisfaction with the program. In May, he told Professionals for the Public Interest – a coalition of unions and professional associations – that whistleblower resolutions were following the "same disappointing vein" as the year before. In fiscal year 2009, OSHA completed 1,947 whistleblower investigations, but recommended litigation or otherwise found merit in only 3 percent of the complaints. "I do not believe that the vast majority of whistleblower claims are simply without merit," Michaels said. "Instead, it appears to me that there are a series of institutional, administrative and legislative barriers that stand between many whistleblowers and justice. These barriers, and our failure to protect legitimate whistleblowers, creates an injustice for these workers, and it discourages other workers from asserting rights." OSHA enforces the whistleblower provisions of 21 statutes, including section 11(c) of the Occupational Safety and Health Act. The statutes cover a range of industries, from rail, trucking, pipeline and nuclear power to consumer product safety, environmental and securities. In a report (.pdf file) released Sept. 16, the Government Accountability Office cited "significant internal control problems" with the whistleblower program. The report said OSHA lacks effective mechanisms to ensure regions comply with policies, does not track whistleblower resources separately from other programs and has not made assessing the program's performance a priority. GAO found the number of investigators has remained relatively flat over the years despite OSHA's growing responsibility for complaints. OSHA enhanced investigator training but has done little to ensure investigators attend courses and have the necessary equipment to do their jobs, according to the report. Following the release of the GAO report, the Department of Labor Office of Inspector General put out a review (.pdf file) of whistleblower investigations under the OSH Act, the Sarbanes-Oxley Act and the Surface Transportation Assistance Act for the 12-month period ending Oct. 31, 2009. OIG estimated that 80 percent of investigations did not meet one or more of the eight elements of the investigative process. These reports are among several in recent years on OSHA’s whistleblower program. In response to GAO's findings, Michaels issued a statement saying OSHA was in the process of a top-to-bottom review to identify weaknesses and inefficiencies in the program. The agency also hired additional personnel to help process cases more effectively. "I plan to make some changes as soon as I can because I’m unsatisfied with the program," Michaels told Safety+Health magazine in October. "I concur with, generally, the findings of the recent GAO report and the various reports that have been critical of the program. We haven't done a good job, and we need to do a better job." The whistleblower program is often described as a "patchwork of laws." In testimony before the House Education and Labor Committee's Workforce Protections Subcommittee in 2007, Richard E. Moberly, associate law professor at the University of Nebraska in Lincoln, said federal protections take a "rifle shot" approach. Whether or not a worker is protected depends on the employer and industry, type of misconduct, and method of whistleblowing. In addition, different laws have different statutes of limitation and burdens of proof. "Suffice it to say, one would never create this system from scratch," Moberly told legislators. "Instead, this network of protections has evolved on an ad hoc basis in order to support specific statutory schemes." Jeff Ruch, executive director of Public Employees for Environmental Responsibility in Washington, echoed that view, calling whistleblower protections "a crazy quilt that benefits people on the basis of geography and happenstance rather than the underlying merits of their cases." In July 2010, PEER and Washington-based advocacy groups the Government Accountability Project and the National Whistleblowers Center asked Secretary of Labor Hilda L. Solis to create a separate, national office for the whistleblower program. Doing so would give the program its own budget, programmatic identity, strategic plan, staff and leadership, and authority to standardize investigation procedures, the organizations said in a letter to Solis. In an interview, Ruch emphasized that OSHA already faces a backlog of standards to finalize. "We think they should concentrate on that and let this other function that they apparently have no interest in find a bureaucratic home where it’s welcome," he said. In late September, PEER sued (.pdf file) OSHA under the Freedom of Information Act for refusing to disclose the results of an internal survey of investigators and managers in the whistleblower program. "The fact that we have to sue, in my mind, indicates the continued bunker mentality that does not bode well for genuine reform," Ruch added. Referring to differences in how regional offices handle whistleblower complaints, Tom Devine, legal director of the Government Accountability Project, said, "This is a government breakdown at its worst." The solution, however, is "relatively simple," he said. "There has to be enforcement teeth at the national office to have laws that mean the same thing throughout the United States with a foundation of consistent procedures in each region." OSHA appears to be moving that way. In 2010, the agency published interim rules for filing and handling retaliation complaints in the railroad, public transit, commercial motor carrier and consumer product industries – a move intended to create more consistency across complaint procedures. According to agency spokesperson Richard De Angelis, OSHA instituted a uniform policy of sharing respondents' responses with complainants and accepting complaints in any form, and will address other consistency issues after receiving recommendations from the review currently underway. A typical whistleblower case goes something like this: OSHA investigates the complaint and reaches a decision. Some cases are automatically reviewed by an administrative law judge; otherwise, the claimant or employer may request a hearing before an ALJ, whose decision may be reviewed by the administrative review board at the request of one of the parties. The ARB makes the final decision for the secretary of labor. Any further proceedings occur in federal court. Devine spoke highly of the qualifications of the ALJs and the ARB, but pointed out that most whistleblower claims fall under the OSH Act, which does not include a private right of action that would allow employees to take civil action if the Department of Labor fails to act. Congress sought to address that issue in the Robert C. Byrd Miner Safety and Health Act, which would have amended the OSH Act to extend the statute of limitations from 30 to 180 days and ensure a claimant's right to an adjudication hearing. However, amendments to the OSH Act were dropped in a subsequent miner safety bill (also named after Byrd) that failed to pass the House in December. Attorney Lloyd B. Chinn expressed support for having the same statute of limitations for all whistleblower claims, but said 180 days might be too long. "From the perspective of trying to promote a safe workplace, it makes sense to have a relatively short statute of limitations because, in theory, what is trying to be promoted here is the prompt reporting of alleged – whatever it is – conditions," he said. Chinn is a partner at Proskauer Rose LLP, a New York law firm that routinely represents employers in labor suits. In April 2010, he testified at a House subcommittee hearing on whistleblower provisions in the Protecting America’s Workers Act (H.R. 2067), many of which were included in the first Byrd bill. At the time, Chinn spoke against permitting OSH whistleblowers to take their claims before ALJs and the ARB, and then to district court if a decision was not issued in a certain amount of time. He still contends the change would increase the caseloads for ALJs and the ARB and not necessarily improve workplace safety. "They already can’t meet the deadlines for handling the claims that they’re responsible for, and I just question whether that system is going to be any better or improve any way on the current system that's being criticized here," Chinn said. He drew a distinction between the process, which he is in favor of improving, and the outcomes (typically complaints being dismissed). "My question," said Chinn, "is where's the evidence that the conclusions that are being drawn within the current regulatory scheme are incorrect?" In other words, maybe most complaints simply lack merit. But attorney Stephen M. Kohn argued the country needs a national whistleblower statute similar to Title VII that will set public policy and create incentives. In his opinion, whistleblower rules and legal decisions are supposed to "even the playing field," but that philosophy has been lost and needs to be recovered. Whistleblowers can have a "massive impact in protecting investors, consumers, the environment and safety," said Kohn, executive director of the National Whistleblowers Center. "[DOL] should recognize the important role, nurture and defend it." Although Kohn rated OSHA’s overall effort "below expectations," he considers the additional scrutiny from GAO and DOL a good sign. "I am happy and guardedly optimistic that the Labor Department is taking a new look at the Whistleblower Protection [Program]," Kohn said. "I am hoping we go from rhetoric to action and that some of these critical reports are taken seriously and that the promises are taken seriously and that we can effectuate change."